The U.S. Justice Department told reporters today that a man in South Florida is in custody in connection with mailing of pipe bombs to political opponents of Donald Trump. Senior law enforcement sources have identified the suspect in the investigation as Cesar Sayoc Jr., 56, of Aventura, Florida. The suspect was arrested in Plantation, Florida. He has a criminal record, and ties to New York. 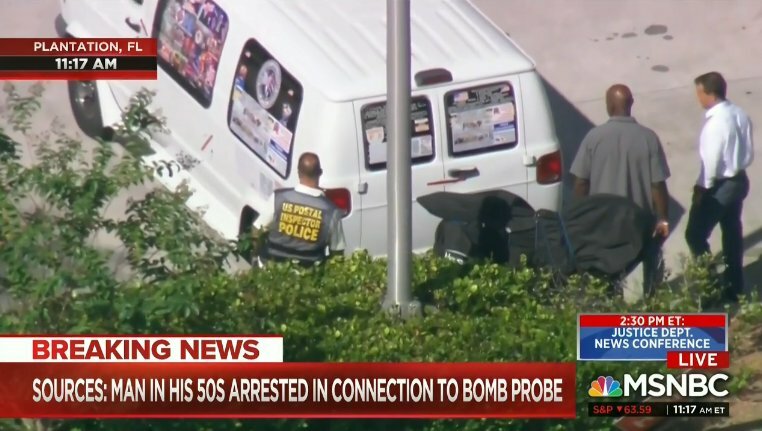 Here is an aerial shot of a van about to be towed in connection with the mail bombing case. The suspect's political affiliations are not yet confirmed, but this sure appears to be what it appears to be. One can get a pretty good idea from his targets. A Florida man has been arrested in connection to the string of suspected explosive packages sent to prominent Democrats this week, law enforcement sources tell the Miami Herald and other outlets. The Miami Herald has learned that the suspect who has been arrested is a man in his 50s from Aventura. He is being questioned by FBI agents with the joint terrorism task force since his arrest this morning at about 10 a.m.
A law enforcement source tells the Miami Herald the arrest was made at an auto parts store in Plantation, Florida. Miami Herald news partner CBS4 reports the arrest was made about 10:30 a.m. Friday morning, and a “loud explosion” was heard at the time of the arrest. CNN reported Shimon Prokupecz tweeted that “multiple law enforcement sources” confirmed federal authorities arrested a Florida man. At least 12 suspicious packages containing explosive devices, and some containing additional white powder, have been discovered since Monday. Two more packages were found earlier today. A news conference by @TheJusticeDept tentatively scheduled for 14:30EDT (18:30GMT). Attorney General @jeffsessions apparently at the @WhiteHouse now to brief @POTUS. The president has now been briefed by Chief of Staff Kelly, US Secret Service, FBI and DHS. AG Jeff Sessions is currently at the White House, as well.